Honor Note 10 Reservations Begin on JD - Playfuldroid! Honor is yet to confirm on the launch date of the upcoming Honor Note 10 smartphone. However, its arrival seems to be getting closer as Chinese retailer JD.com has started receiving its reservations. 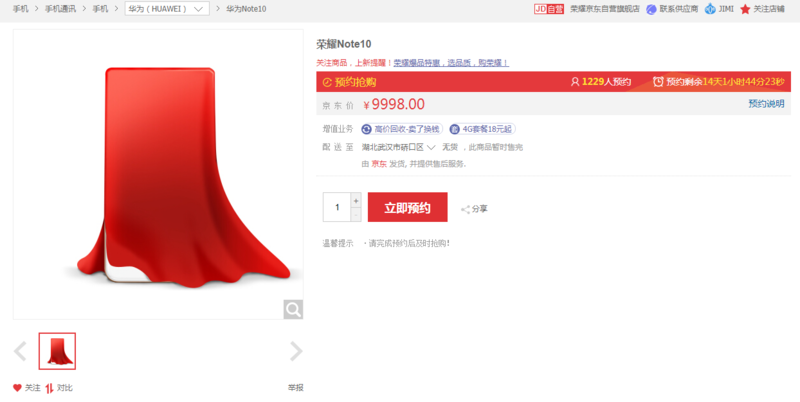 The product page of the Honor Note 10 on JD states its reservations have started from today and it will continue until July 25. This suggests that the Note 10 could be made available for buying from July 26. However, the Chinese manufacturer is yet to confirm on the launch date of the smartphone. Recent leaks have revealed that the Note 10 will be coming with a Super AMOLED display of 6.9 inches that produces QHD+ resolution. Some reports have claimed that the massive screen of the phone may sport a notch since it is expected to arrive as a bigger version of Honor 10. The Kirin 970 SoC is expected to power the Honor phablet along with 6 GB of RAM. It is likely to feature 128 GB of storage. A 24-megapixel + 16-megapixel dual camera setup may reside on the back panel of the phone. It may feature a selfie shooter of 16-megapixel. A 6,000mAh battery may power the phone. The handset is expected to carry support for 5V/4.5A fast charging. Other rumored features of the phone include USB-C and NFC.